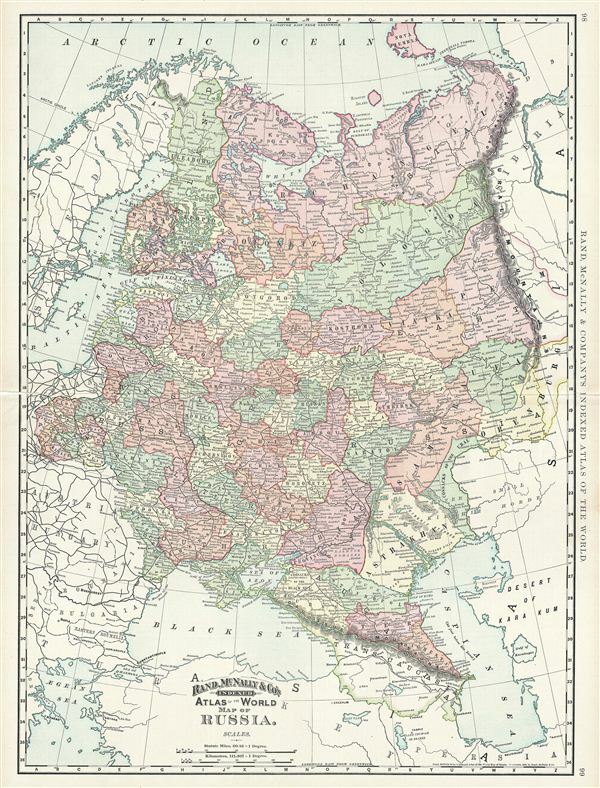 This is a beautiful example of Rand McNally and Company's 1892 map of european Russia. It covers from Nova Zembla to Transcaucasia. Russia during this time was under the rule of Alexander III, who, after the assassination of his father Tzar Alexander II, took over the empire. Alexander II is best known for his liberal reforms including the emancipation Reform of 1861 which liberated Russia's countless serfs and is considered to be one of the most important events in 19th century Russian history. Though Alexander III's rule was not considered to be as liberal, it was more peaceful. Color coded according to regions and territories, the map notes several towns, cities, rivers and various other topographical details with relief shown by hachure. This map was issued as plate nos. 98 and 99 in the 1895 issue of Rand McNally and Company's Indexed Atlas of the World - possibly the finest atlas Rand McNally ever issued. Rumsey 3565.025 (1897 edition). Philip (atlases) 1026 (1898 edition).